Ski boots are in general constructed out of three different types of plastics. They can be made out of one of the types or a combination of them. They are: Thermoplastic polyurethane (TPU), Thermoplastic polyolefin (TPO) and Polyamid (PA). If you are a bootfitter it's necessary to know a thing or two about plastics because a great deal of your bootfitting work is to modify plastics with heat. Is a high quality plastic blend that is very common to use in good quality ski boots due to it's mechanical properties. The TPU consists of two parts. The hard part and the soft part. The hard part is PU (Polyurethane) and the soft part consists of either Polyether or Polyester. You will find TPU in performance boots for example. TPU is very good to work with as a bootfitter. You can grind it, heat it and stretch it fairly easy. It's pretty straight forward. Is a cheaper plastic mostly found in entry level ski boots or cheaper ski boots in general. The TPO is a mix of of PP (Polypropelene) and a more elastic part as for example SBS (Styrene butadiene styrene) to get the desired properties. TPO is a little bit more difficult to work with as a bootfitter due to it's properties. It melts easy when heated with a heating gun and it's hard to grind with a nice looking result. The plastic melts because of the friction heat generated by the grinding tool. Is normally referred to as Nylon. In ski boots you will find Nylon 12 and Nylon 11 plus different brand Nylons as Grilamid and Pebax. Grilamid is 100% Nylon and Pebax is a co-polymer with one part PA and one part PE (Polyether). The properties and characteristics of these Nylons makes it very interesting to use them when constructing new types of hybrid ski boots such as lightweight boots with hiking mode combined with good skiing performance. The boots made of Nylon can be a little bit tricky to work with as a bootfitter because often these boots will have thinner material thickness and sensitive parts on the shell. They also have a more narrow temperature window to work within, meaning that the temp range from the Nylons HDT (Heat distortion temperature according to ISO 75) to the melting temp is smaller and therefore requires more caution when heating them with external heat. Pebax burns easily when using a heating gun. Moderns ski boots made of different Nylons are in general expensive boots. 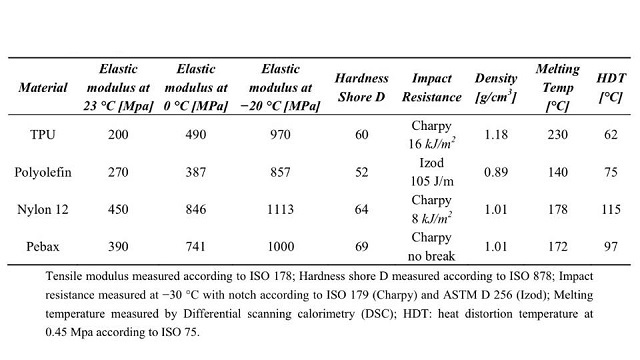 Below is a table of plastic properties that will work as a guide for you. I would highly suggest you to ask your tech reps about more info about the plastic types they use in their boots and what temperatures they would recommend you to use when stretching the shells. What is that? Have you ever heard of the toxic isocyanates? If you are heating plastic with a heating gun there will be a great risk that you also will be releasing this toxic gas without even knowing about it. The isocyanates starts to release in gas form from temperatures around 150 Celsius and above. Guess what! The isocyanates are used primarily in the production of various polyurethane products! Isocyanates are a group of nitrogen compounds that are widely used in the chemical industry. They constitute a serious occupational health problem, as they may, in very small amounts, cause severe asthma and other health issues. How do you avoid the toxic gas? First of all get yourself education about heating plastics. Then have a good ventilated space to work in. The easiest way to avoid the gas is to not heat the plastic at all to around 150 degrees Celsius and above. The Bootfitter heating system will make sure you can control the temperature with accuracy within your needs.